Because I am inherently lazy, one of the best bits of London Fashion Week for me is always visiting the Glam Media suite (Pamflet is part of Glam’s blogger network.) I love hunkering down in the Dome room at One Aldwych and availing myself of their WiFi, sandwiches and sofas. And this year there was something even better – L’Oreal Elnett’s hair fix bar. After queuing in the pouring rain waiting to enter a show venue (only for us to be told it was ‘oversubscribed and they were only letting the front row in’, FFS), my hair was looking pitifully limp, frizzy and in need of scjhoozing (jchooshing? you know what I mean). 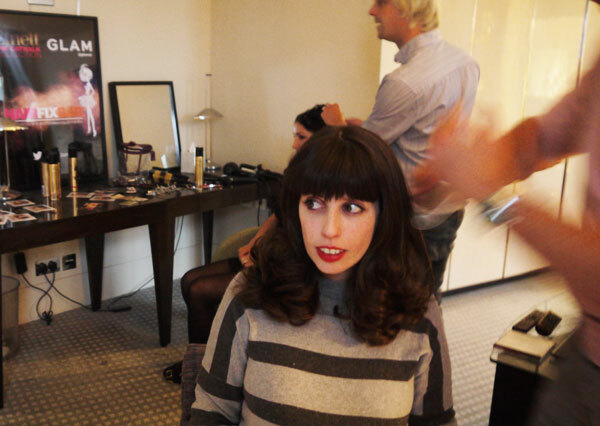 So I plonked myself down in stylist Simon Izzard’s chair and, breathing the heady, comfortingly familiar Elnett-scented air in, let him work his magic. I am completely useless at styling my own hair – I can’t use rollers or hair straighteners properly (my arms are too weak), don’t understand which products do what, and tend to tip it upside down, blast it with a hair dryer and scrape it into a top knot to ‘encourage’ some curls to form – hence why I always look a bit scruffy. Simon told me that the whole ‘dirty hair holding styles better’ thing is a myth – apparently you’re actually fighting against the hair’s natural oils and end up having to use dry shampoo to get it back to a workable state. Hair stylists far prefer working with freshly washed hair that they can then ‘dirty’ using products – one of his pet hates is models showing up for shoots and shows with grubby hair. He pinned up the top section, then blow dried the back straight and started blow drying sections into loose curls with a round brush, using a very fine nozzle on the hairdryer. The end result was a head-full of bouncy curls which have lasted for days (in fact, much like leftovers, I think blow-dries are actually better on the second day). 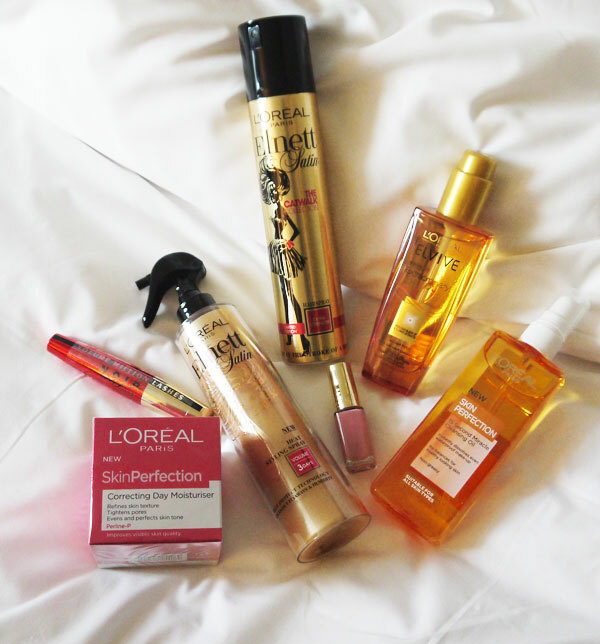 And I got a fancy goody bag stuffed with L’Oreal products, for which I am very grateful. Experience the magic of a fashion show with the new Limited Edition Elnett Catwalk Collection. Products come and go on the catwalk but one will remain iconic. For over 50 years, Elnett has been famous for its legendary hold and has become a cult favourite of runway stylists around the globe. 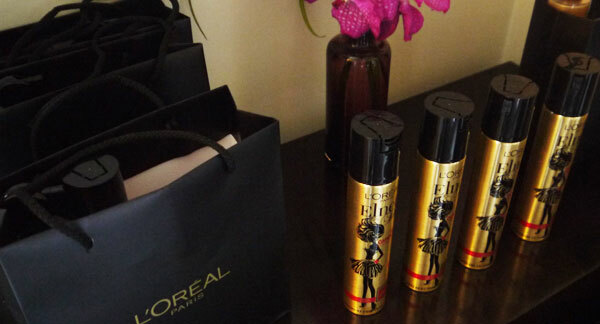 This year, the iconic and recognisable hairspray has been reinvented to celebrate the Fashion season. Disclosure: Compensation was provided by L’Oreal via Glam Media. The opini ons expressed herein are those of the author and are not indicative of the opinions or positions of L’Oreal.